"Hawks can fly very high and rabbits can run very fast". Each animal has its special merits in the competition of survival. As a matter of fact, this is no exception for plants too. 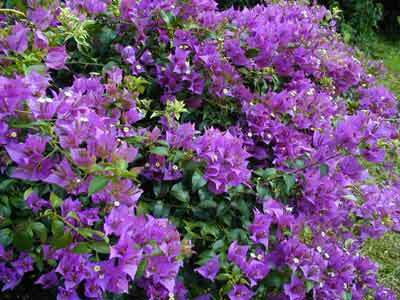 The national flower of Zambia � bougainvillea, is one of such examples. The flowers of bougainvillea are small and they have no fragrances either; so it is very difficult for them to attract bees and butterflies to do pollination for them. However, in order to produce offspring, the flower has its own tricks. It enlarges the buds next to the petals and dyes them into red, yellow, white, orange or red and white colors, which look quite like beautiful flower pedals. In this way, the flower becomes a place frequently visited by bees and butterflies and its problem of reproduction is settled.